RED Mountain Resort is known for light, dry snow; world-class tree skiing; incredible steeps, laid back vibe and friendly locals. They also offer expanded terrain for cat skiing access on Mt. Kirkup. RED is home of ski racing in Canada and offer a brand new Legacy Alpine Training Centre. Cafeteria, coffee shop, ski shop, rental shop, high performance rental shop, adventure centre, day care, ski school. 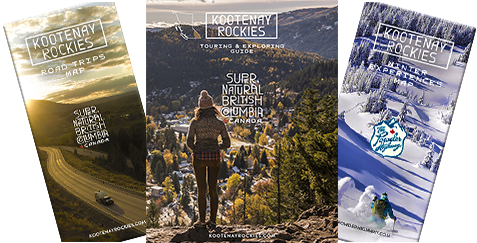 On-mountain accommodations and minutes away in the cities of Rossland or Trail. The Resort is beyond proud of its recent expansion to contiguous Grey Mountain, complete with a chairlift. This adds almost 1,000 acres - and a whole new mountain - to their already 1,685 acres and skiers can access one more stellar peak, Grey Mountain by chairlift - with 360-degree skiing off the top! This development of Grey Mountain marked one of the single largest expansions of an existing resort in North America in five decades. RED Mountain Resort recently added nearly 200 acres on Mt. Kirkup with in-bounds cat skiing. This cat-skiing operation will act as a shuttle from Grey Mountain to the peak of Mt. Kirkup with seats sold on a first come, first served basis for only $10 with the purchase of a lift ticket or season pass. This cat shuttle will access acres of gladed tree skiing, three recently cut runs and the expansion has 1,600 feet of vertical. On-mountain amenities at RED include their historic day lodge with cafeteria seating, fast food service, a conference centre, retail & rental areas and a coffee & wine bar. The first downhill race was held here in 1896; since then, skiers, boarders and backcountry touring enthusiasts of all stripes, have been making daily ascents of Red and its twin, Granite Mountain. You'll enjoy exploring the exhilarating steeps, powder-filled bowls and some of the best tree-skiing in North America. When your legs need a rest, Paradise Basin offers a wide selection of exceptional groomed runs. New to RED, Get Lost Adventure Centre located at the base area takes the regions best guides and gear and puts them under one roof for the first time ever. This seamless digital platform allows you to book your fat bike session from the SeaTac security line or your nordic fondue tour from your kid's soccer practice. And, Big Red Cats offers cat-skiing just 10 minutes from RED. Great package prices are available for individuals, families and groups. Stay on mountain or downtown Rossland, just five minutes away. Shuttle services available between Rossland and Spokane International Airport, Kelowna International, Castlegar Municipal Airports and Trail Regional Airport. Voted Canada's best ski town and now in the Top 20 of all North American Resorts by Terrain Scale, Rossland combines outdoor adventure with small town warmth and hospitality. Great restaurants, quaint shops and friendly locals will make your stay in Rossland as memorable as the powder. The resort offers 7 chairlifts. In-bounds cat skiing from the resort village. Many fun events take place throughout the winter season. Red Mountain Resort is known for dry light snow.